Give A Gift And Support The ISC - Starts Today! Give The Gift Of Shakespeare! Do your holiday shopping and support the Ithaca Shakespeare Company at the same time! The Ithaca Shakespeare Company is participating in the Ithaca Alternative Gift Fair, held 11 am to 6 pm, Saturday December 7 at the First Baptist and First Presbyterian churches bordering Dewitt Park, near the corner of North Cayuga and Court Streets. The fair is a great time for you to show your support for our work, in big or small ways. Along with 60 other local not-for-profit organizations, we will be offering a selection of gifts that you can purchase for everyone on your holiday shopping list. You buy the gift in their name, and the funds go to support the organization offering the gift. Our gifts will provide support for upcoming productions and both new and existing educational outreach programs (see listing below). Can't make it? All of the gifts can be purchased online from December 8 through 31 on the fair's website: www.ithacaaltgiftfair.org. In conjunction with Giving Tuesday, early bird online giving -- and a preview of the gifts -- will also be available December 3 through 5. Gift 1: $5 will help make a costume for a child to wear in our "Shakespeare Lane" program at the Family Reading Partnership's annual Bookfest for Kids. Gift 2: $10 will put a board in the stage for our outdoor summer Shakespeare shows at Cornell Plantations. 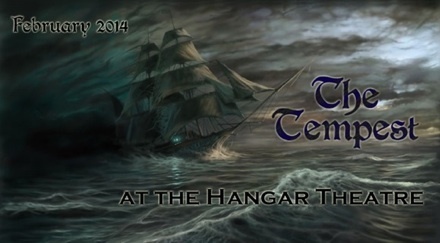 Gift 3: $15 will help create the special effects to bring the storm and magic of The Tempest to life in February. Gift 4: $25 will help a child learn to love Shakespeare at our new Shakespeare for Kids Camp coming this July in conjunction with our summer performances. Open Gift: Choose any amount to help Ithaca Shakespeare continue to offer clear, exciting Shakespeare to audiences of all ages! Each gift you buy comes with a card that describes it and a free greeting card. Plus, the fair is fun for everyone, including children. Come by our booth [Table #16 in the First Presbyterian Church] and say hi. We hope to see you there!